PS7′s scored quite a coup when it nabbed top mixologist Gina Chersevani as its “head mixtress” back in January. One of my favorite places for drinks, its lounge lined with banquettes and windows is a great happy hour spot on any night. From 5:30-7:30pm you can sample their 12-Year Doublewood, 15-Year Single Barrel, and 17-Year Rum Cask scotches. Of course there will be noshes. And may I remind you that legally Scotch may not be bottled at under 40% alcoholic volume. So please, indulge in the nibbles while you sample and learn. It is only Tuesday, after all! By coincidence, one of my partners sent this to me yesterday. 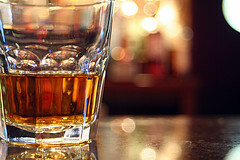 “It is hard to imagine a place more suited to producing fine malt whisky. Surrounded by mountains on three sides and volatile open sea on the other, and fed by the pristine waters of a fast-flowing river, it is the stuff of distillers’ dreams. The Highlands of Scotland, though, lie thousands of miles to the west: the home of the best single malt whisky in the world is Yoichi, until last year a little known town on Japan’s northernmost island of Hokkaido. Its rise to the pinnacle of the centuries-old tradition of turning barley into “the water of life” was enough to make any proud Scotsman weep into his tumbler of Glenfiddich. I have not tried either, but I shall. The author is referred to this Eric Asimov post on the NYT blog “The Pour.” Calling it Scotch whisky is not redundant; ‘Scotch’ should be capitalized. Typically if it’s from Scotland or Canada it’s ‘whisky,’ and if it’s from anywhere else it’s ‘whiskey’ unless the bottlers prefer the other spelling (my bottle of Wasmund’s – a single malt from Virginia – spells it without the ‘e’). The author thanks the kind commentor for the elucidation. So corrected. Radman, that’s fascinating about the Japanese whisky, thanks for the timely info.